Program comprehension requires developers to reason about many kinds of highly interconnected software entities. Dealing with this reality prompts developers to continuously intertwine searching and navigation. Nevertheless, current integrated development environments (IDEs) address searching by means of many independent and disconnected search tools. This not only impedes developers from reusing search results produced by one search tool as input for another search tool, but it also makes it difficult to find appropriate search tools, in the multitude of other tools provided by an IDE. 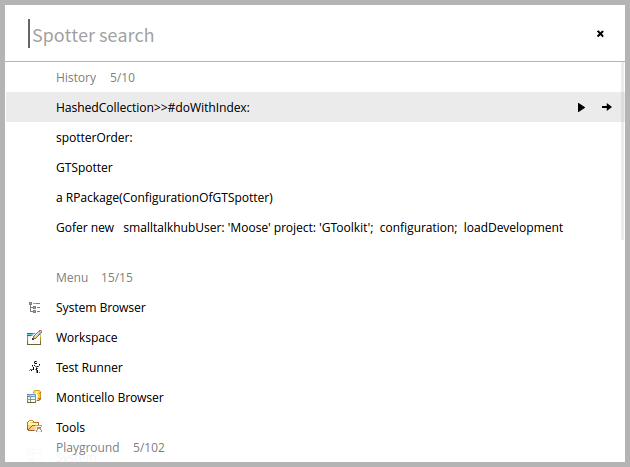 Searching for classes or packages is a common code search requirement. Although very similar in nature, these two searches are too often supported through separated search interfaces. Spotter integrates them easily in one. In the example below we see the basic interface that is triggered via Cmd+Enter. 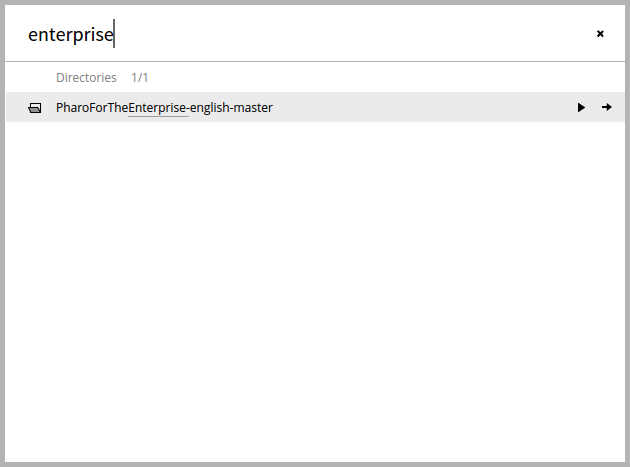 On top, the user can enter a textual query, and below the search is executed through multiple search categories. In our case, entering GTSpo, leads to matching 39 classes (of which only 5 are shown) and 1 package. For each element, the matching substring is underlined. While packages and classes are typical structural entities, annotations can be equally important. 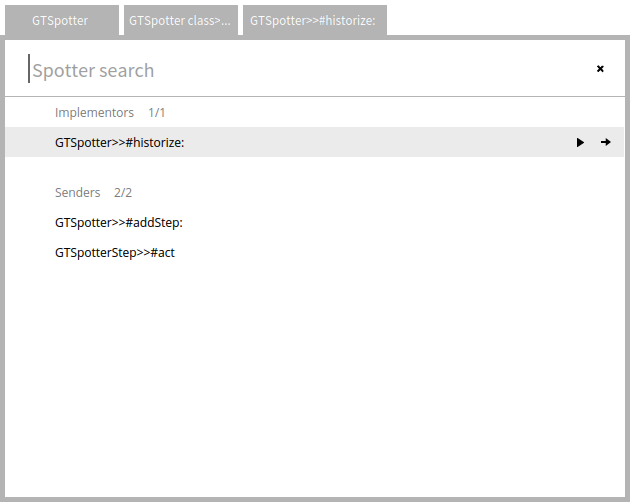 Spotter searches for annotations (named ‘pragmas’ in the target language for our implementation) in the same interface. In this case, pressing Enter opens an inspector on the PragmaType object. 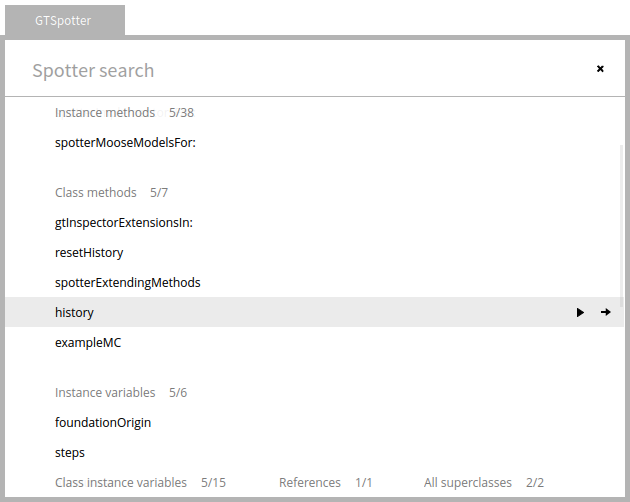 Searching for implementors is another common code search use case. 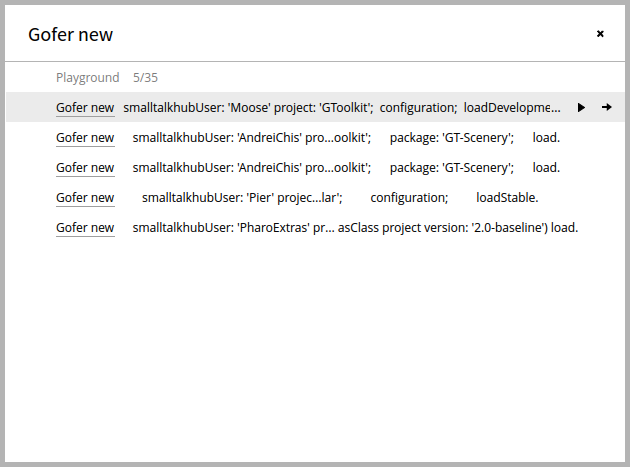 Until now, the way to search for implementors in Pharo is to open a Playground/Workspace, enter a the symbol, press Cmd+m and then close the Playground/Workspace window. Spotter makes it easier. It’s not just code that is interesting for search. Finding a tool is a search activity as well. That is why, the Spotter offers, by default, through menu items. GTPlayground remembers all snippets ever used within the image. This is nice, but it can quickly become hard to find a previous snippet. That is why, Spotter makes this list searchable. Pressing Enter reveals a Playground populated with the desired code. 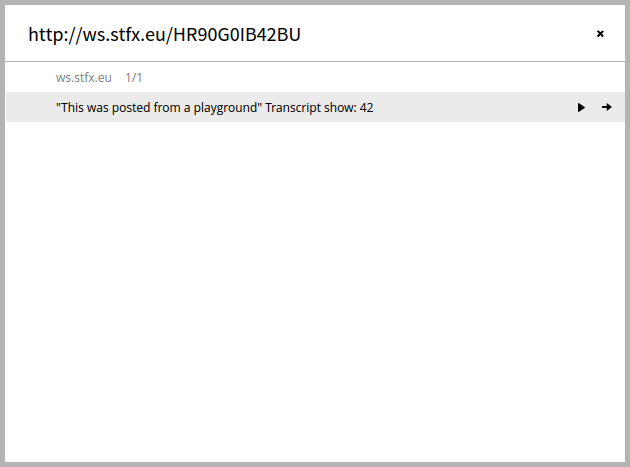 Since a while, the GTPlayground has the ability of publishing the contents to the sharing service available at: http://ws.stfx.eu. However, until now, the playground offered no easy way to load the contents of a published page. Spotter fixes the situation: simply pasting the url offers an object with the remote page. Pressing Enter opens a playground with the page contents. Spotter can find various types of objects rather fast. Yet, often we just want to get to the objects we just visited recently. 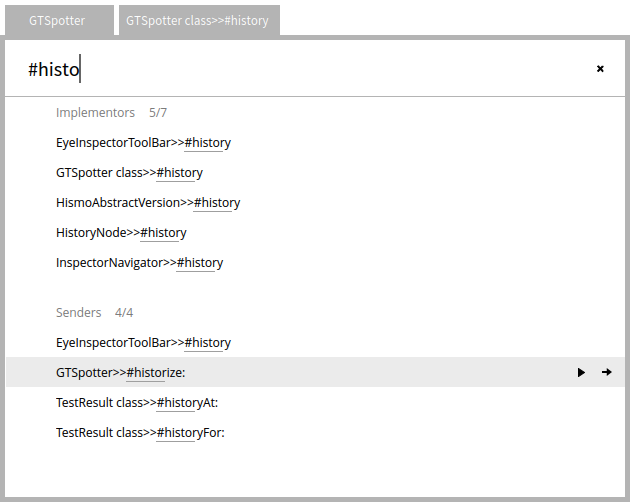 It is for this reason that Spotter offers the history of previously spotted objects by default. For example, the picture below shows a history of 5 most recent objects. Typical IDE search tools behave like general search tools in that they offer only one level of search. However, software systems have structure, and we often need to be able to search inside a found object. To this end, Spotter allows the user to dive in an object and continue searching through the same interface. This is accomplished by pressing Cmd+RightArrow. For example, the below picture shows the case of going inside the Spotter class. 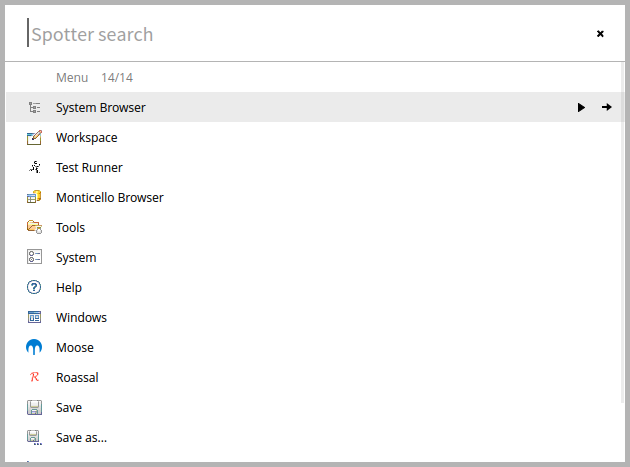 The context of the current search is shown in the breadcrumb on top of the window. For this method, the user can search through class related facts such as methods, variables or references. But, Spotter is about objects, not about code. To exemplify the implication of this, let’s consider the typical use case of looking for a file somewhere in the directory structure inside the current directory. In the below picture, the main Spotter finds a directory. 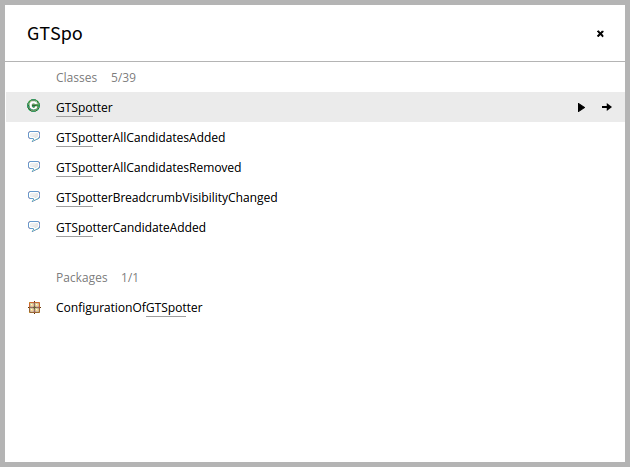 The GTSpotter implements the ideas behind the Moldable Spotter model as part of the GToolkit project. It is available in the latest Moose image which can be downloaded from the Moose website. 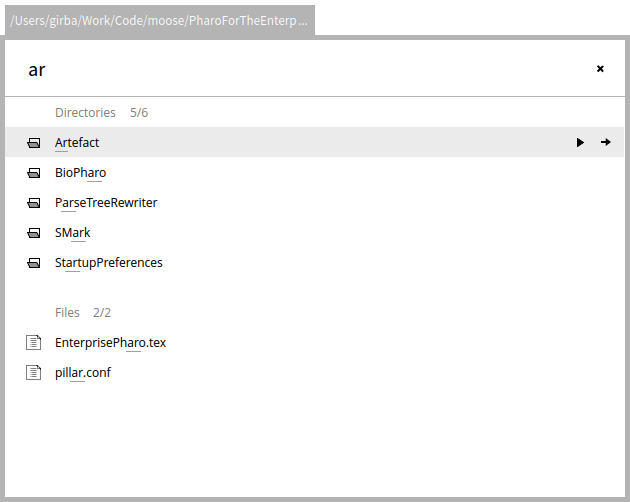 It is also integrate in Pharo. The existing implementations already comes with more than 100 various categories that support a rather extensive set of common search actions. However, the true power of GTSpotter comes from it being moldable. 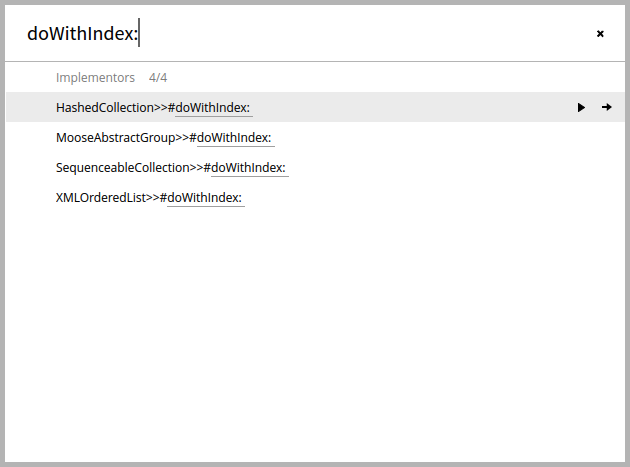 Custom searches for an object are defined as extension methods in class of that object. 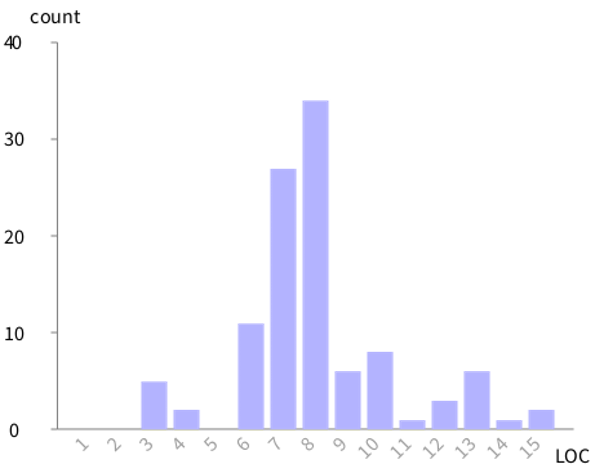 The histogram below shows the the size distribution (in LOC) for 106 custom extensions. On average an extension takes 8 lines of code. 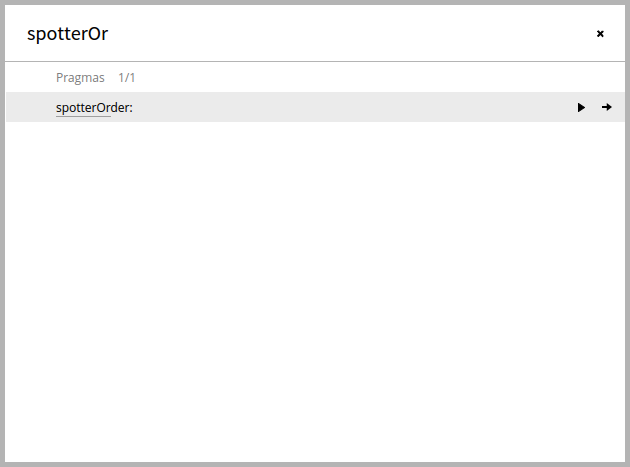 That means that you can get your objects to be equally searchable with just a handful of lines of code.